Our first musical spotlight is Levi Anderson. His passion for music began in elementary school and never stopped. Currently, Levi is president of the Tri-M Music Honor Society, previously serving as the secretary, and is also a member of the National Honor Society. This year, he plays in the concert, orchestra, and jazz bands and he is a music teaching intern for the JFS 7/8 band. Throughout his music career at U-E, he has participated in multiple BCMEA bands and orchestras, the NYSSMA Solo/Small Ensemble Fest a total of fifteen times and has been invited to play in the NYSSMA Honor’s Concert the past three years. He has also performed on stage in the middle and high school musicals and assisted as a stage crew member and in the pit as an orchestra member. He has also been a member of Holiday Strings since freshman year, performing holiday music at local nursing homes and hospitals for patients and staff. Additionally, Levi has been an active member of the U-E Tiger’s Pride Marching Band for six years, serving as drum major the past two years, and the front ensemble captain the two years prior. In May, Levi will make his solo concerto and conducting debut at the String Chamber Concert. 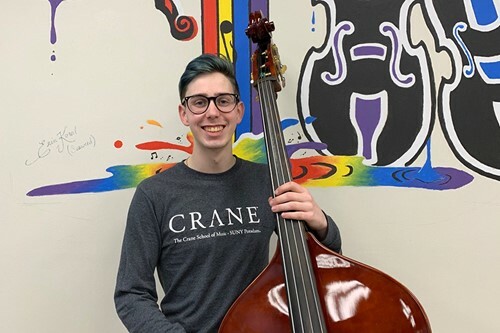 In the fall, Levi will attend The Crane School of Music (percussion and double bass) majoring in music education and music theory/history with a minor in jazz studies.